A few people have asked me about blocking, what is it? And why do we block knitted items? Blocking is a way of shaping and making a garment look better. There are varies ways that you can block an item, which depend on the type of pattern and yarn that have been used. It’s mostly used for items made from natural fibres such as wool or Alpaca. Some yarns you do have to be very delicate with while others are more robust, so you can just put them in with your regular laundry and they will be fine. Do please check the directions for washing the yarn before you start getting it wet. There are two main types of blocking yarn: wet blocking and steam blocking. Wet blocking is great as you can just dunk to finished item in water with a washing powder, rinse it through, carefully wrap it in a clean down to get rid of the excess water, then place it on a blocking mat (I bought a children’s play mat that fits together like a jigsaw, which works well and was just a fraction of the price for a blocking mat, which does the same thing but more expensive), pin it to the exact requirements, then leave it to dry. Steam blocking is mainly used on acrylic yarns as they are man made fibres and the steam melts the plastic that’s inside the yarn to form the shape you want. I tend to use this when I’m making toys and especially if I’ve made a small item using stocking stitch as it tends to roll up, which is really annoying, lol. So, I make it behave by steaming it. 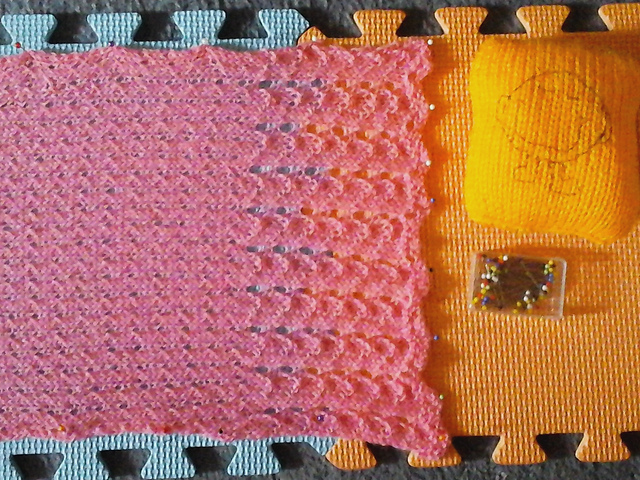 On this picture, you can see how by blocking the scarf that the holes, created by yarn overs – as it’s a lace pattern, are a lot more open when blocked and this produces a much nicer effect, than not blocking it. Of course, you don’t have to block things if you do not wish to, it just depends on the type of look you want in your garment and it’s predominately needed for lace patterns.